What is Quality Content that Really Works? “We buy our blog posts 500 EUR a piece” he told me the other day. “What kind of blog post are that?” I asked. He was buying 10 of these blog post a month, on average 500 words per blog post. That’s probably the worst approach this marketing manager could take towards content. The output he gets by aiming for 500 words articles is just horrible. It’s usually a “one-pager”, with one single meaningless graphic, pulled from a stock-photo website. Others might tell you that you need 1500 word articles, because these are going to make you end-up higher in search-engines. I say, that’s crap. Don’t believe them. In a world filled with content, and decreasing user attention, this kind of simple approach to content is just not going to cut it. 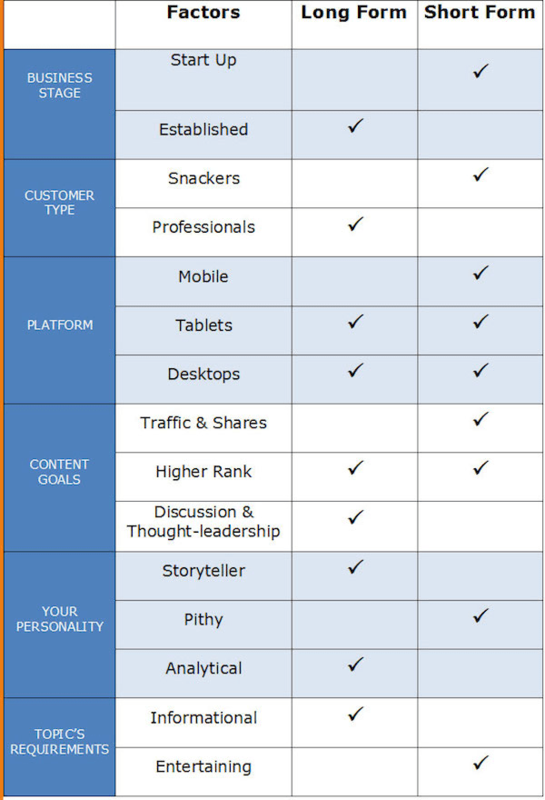 and finally how you can get organized for content quality. Every marketer today talks about quality content. “We need great, engaging, regular, high quality content” they all know. Because that’s what you want to have if you want to rank well in searches. We all know about the successive Google search algorithm updates, culminating in it’s most recent version Panda 4.2 of which nobody really knows what it does and how it works (except for Google, hopefully (pun intended)). The business model of Google is based entirely on providing value to its users. When people search on Google, they click on a search result. If after a short while they return to the search engine, this means that the search result wasn’t what the user wanted. It also means that the users’ value from Google was not good enough. That is why Google is constantly improving its search engine algorithm. It is critical for them to remain relevant to their users. How does Google judge Content Quality? How does Google calculate Content Quality? Webpage purpose: every page on the internet should be created for a purpose. A quality score is therefore a measurement of how well a page achieves its purpose. Search intent & holistic content: content is now judged by Google based on how comprehensive a piece of content is covering a subject, and not by semantic search using single keywords or disconnected items. Length of text on the page: there is a clear connection between search results and the length of a top ranking piece of content. But that doesn’t mean every piece of content you produce needs to be a lengthy meaty piece of content of 1000 or 2000 words. How long content should be is a really big question of many marketers, so I will cover it in detail further down this post. Readability of your content: depending on your audience, the difficulty of your content might vary. But in general, and especially when you are writing for the online world, your content should be easy to read. The Flesch readability scale is often used to analyse word and sentence length, to asses the legibility of content. Presence of images, links and multimedia: sites that rank in the top 10 in Google’s search, according to Econsultancy, tend to have between 6-8 images on a page for example. Compare that with agency delivering one single stock-picture in 500 EUR blog posts… sad, sad, sad. Advertising on the pages: high ranking websites often include less advertising. Adlinks and Google Adsense integrations are judged negatively with good rankings, which makes sense. Because Google wants people to find and read holistic content rather than be distracted by advertising. Bad grammar and spelling mistakes: Not only does content quality impact audience perceptions, search engines like Google and Bing are just as unforgiving. Acrolinx studied (link goes straight to the PDF) the co-relation between bad spelling and grammar and website rankings, and although many factors go into a search ranking, it’s an interesting observation nonetheless. There are many many other aspects to how Google judges the quality of content. To understand the full extend of what you need to pay attention to, Google has even created a Google course in creating valuable content, and published Google content guidelines. Does Google penalize bad Content Quality? Many webmasters have war stories of Panda updates. And bad content is absolutely penalized. In Google’s bad content quality guidelines, Google makes it clear that it will even take manual action against sites that are not in compliance with its guidelines. The fact that Google has updated Panda so many times indicates how important it considers high-quality content to be. Example of a website hit by multiple version of the Panda search algorithm. Meanwhile, marketers know that the classic “black-hat tricks” should be avoided (check out these ‘quality guidelines’ which are basically the things you should not be doing). To me, building a sustainable brand is done through high quality content (now that’s a smart statement, Tom). Even when you follow all quality guidelines of Google, that doesn’t mean your customers will like what you create, or that Google will reward you with traffic and search rankings. How do customers or consumers judge Content Quality? The internet is full of statistics that prove people aren’t reading your entire articles. 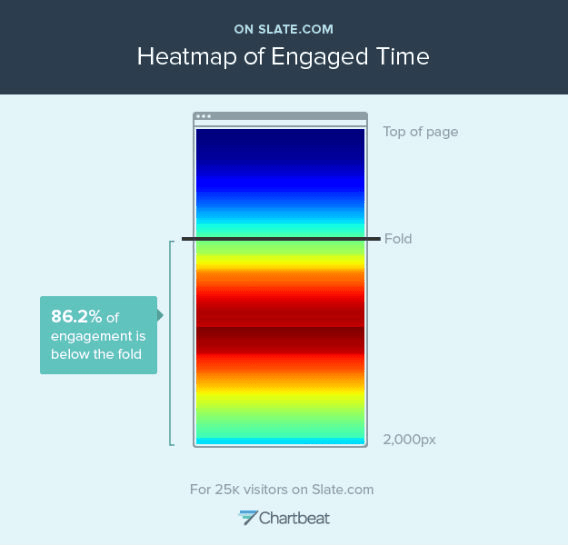 Funny experiments from Slate and the Verge have shown that people share a lot of content, but most visitors read about 50%. Jakob Nielsen, told us way back in 2008 that most users read about 20% of the words on a page. So if people don’t read articles, why would you go through the trouble and money to create long 1500+ words blog posts, if more than 50% of what is written is just waste? Today people are scanning, skimming and skipping pages. Because people are busy. Only those people really reading your content are the ones that really matter anyway. Interested people will read your content. Those are the ones that will be engaging with you. Your job is to attract interested people. But how do you do that ? What is Quality Content that attracts customers? As told earlier, the first image they see should be related to you content, and not a generic image you think looks good with the story. Better yet, use multiple images as users will glance the content to judge if they are going to start reading or not. This image is first found in social media, and has to catch attention. I am a firm believer of “non-fluffy” images, meaning that images need to add value to the context of the content. The inverted pyramid is a metaphor used by journalists and other writers to illustrate how information should be prioritized and structured in a text (e.g., a news report). It is a common method for writing news stories (and has adaptability to other kinds of texts, e.g., blogs and editorial columns). In an interesting experiment from Buffer they showed that posts with a narrative intro had nearly 300% more people to scroll through the story and the average time on page was more than five times higher. Keep your content organized, along the best practices of the content format you are using. When you are writing blog posts, understand the blogging best practices. If you are creating an ebook, understand the ebook creation best practices. Or when you are running a webinar, again, understand what it takes to excel in doing that. 5. Don’t worry about length. Length doesn’t really matter. Some people think that blogs should be really short. Some people think they should be really long. The truth, as usual, lies somewhere between the two extremes. If you ask me, too many people dealing with content simplify content creation to number of words and images. How to get organized for content quality? I hope this articles acts as a reminder and wake-up call for brands, agencies & publishers to not take the lazy route. Quality content takes understanding Google, understanding your buyers, understanding content and digital marketing, and so much more. How do you embed the knowledge of creating content quality into your organization? Don’t try to fool the system by applying ‘black hat tricks’ and follow Google’s webmaster and content guidelines. And remember, many people will be attracted to your content if you do this right. Many of them won’t read the whole thing, and that’s okay. Some people will read your content in detail. And that’s the audience you want.That’s it for this one. Thank you for reading this far. What do you consider content quality? P.S. I am going to write a couple more blog posts in the coming months on this subject. If you want to be notified when I post them, just subscribe to this blog.